CHRISTMAS WITH THE CARMICHAELS by Christine Bush, USA Today bestselling author. Widow and retiree, Gabby, is ready for a rocking chair. At least according to her daughter. Except maybe she’s not. After getting stranded in a Maine snowstorm with a silver-haired fox, Gabby might find the courage to say “yes” to life once more, and find a Christmas love she never expected. SWEET PEPPERMINT KISSES by Josie Riviera, USA Today bestselling author. Sometimes the best gifts are hiding right under your Christmas tree. His emotions were once trampled flat. Can he throw his heart over the fence toward the ultimate Christmas gift—a future filled with love? A holiday tale about the healing power of love, set in the charming fictional town of Turning Point, Virginia. CHRISTMAS IN PARIS by Roxanne Rustand, USA Today bestselling author. Heather, a Kindergarten teacher, thought all her dreams were coming true—until she was jilted by her fiancé three months before their Christmas wedding. Since the honeymoon to Paris is already paid for, Heather decides to go solo and have a great time, no matter what. Love is not part of her travel plans, but when a handsome young doctor literally runs into her on the street, the magic of Christmas in Paris may cause a change of heart. SECOND CHANCE CHRISTMAS by Kristin Wallace, USA Today bestselling author. Ten years ago, Mia Reynolds and Win Barrington spent one magical Christmas together. Until lies and manipulation at the hands of Win’s wealthy family tore them apart, and left Mia to raise a daughter on her own. Now, both have returned to their hometown of Palm Cove, Florida. Once they uncover the truth about what happened, can Mia and Win rediscover the love they once lost and celebrate a Second Chance Christmas with their daughter? CHRISTMAS PIZZA TO THE RESCUE by Jean C. Gordon. When a freak winter storm strands them alone at the Team Macachek barracks in Central New York, champion motorcross racer, Royce Evans, and out-of-work investigative reporter turned pizza deliverer, Samantha Linder, strike a bargain that benefits them both. But when it appears Sam has broken the agreement, will the spirit of Christmas be strong enough to save their blossoming holiday love? THE LOVE CLAUSE by Liwen. Y. Ho. He needs a fake girlfriend to advance his career. She needs a pretend date to keep her mom off her case during the holidays. The solution to both of their problems? A contractual relationship with one clause: neither of them can fall in love. A Christmas tale set in romantic San Francisco that will cause both of them to rethink the “no love” clause. THE MISTLETOE BACHELOR AUCTION by Milou Koenings Her sister decides to bid on a bachelor for Rose to date. This is a fund raiser for a literary program called “ The Mistletoe Bachelor Auction. The man bid on for Rose’s date is a volunteer fireman and electrician by trade. His name is Ryan Gordon. Come take an open sleigh ride in the snow with the couple. You will get swept up in the magic of the smoothly written story with a great cast of characters. Ghosts From Christmas Past by Mary Alford This story takes place in Bitter Creek, Colorado. Charlotte Swenson has been in a coma for eight years. She was in a car accident on Christmas Eve with her parents. Both her parents died in the accident. Sheriff Dylan Parker who grew up with Charlotte has faithfully visit Charlotte throughout those eight years. Now a few days before Christmas, a miracle occurs..... Charlotte awakens from her coma with no memory of her past life. Dylan hopes she will eventually remember him. Will the season of Christmas bring Charlotte’s memories back? This story shows the power of love and devotion. The writing flows smoothly throughout the whole story bringing the magic of Christmas into the reader’s heart. Sweet Peppermint Kisses by Josie Riviera Vance Thatcher and his sister, Gertrude live on a horse ranch. Gertrude has an accident with a horse so Chiara has been hire to care for her until she is able to care for herself. When Chiara arrives at the ranch called Wellington Point, she is taken back as there are no Christmas decorations. It seems the Thatcher family never celebrated Christmas at all. Chiara is about to change this. Both Vance and Chiara grow on each other. Both had been in bad relationships so they need to overcome their past to move into a better future. Being with each other seems to help them grow but Chiara is due to fly home soon. What will happen between them? Will the magic of the season bring a happening ending between them? Christmas In Paris by Roxanne Rustand Descriptions of Paris plus the attractions visited is deftly woven into the story so the reader sees Paris through the eyes of the characters. Holly Foster is a Kindergarten teacher who is using what was supposed to be her honeymoon trip to Paris to visit on her own. Jack Gains is a pediatric physician who attended a medical conference with his sister. As Holly leaves the hotel, she literally collided with Jack. Falling flat on the sidewalk. Jack comes to her aide after their collision. GHOSTS FROM CHRISTMAS PAST: Charlotte has been in a coma for 8 years. Dylan has stayed by her side all these years. He loved her then and he still loves her. Everyone told him to give, that she would never wake up, but he wouldn't give up. All of a sudden, she wakes up and everything in so foreign to her. Dylan isn't sure if they will continue their future together, but he has a big secret and isn't sure how Charlotte will react. He just needs to give her time to adjust to her new life. Maybe. CHRISTMAS WITH THE POKER GROUP: Do you believe in love at first sight? It can happen. As Sabrina has Christmas dinner with her grandfather's friends, she is asked to play along with an incredible guy when he is trying to keep the other women away. Sabrina goes along and before she knows it, she is falling for him. CHRISTMAS WITH THE CARMICHAELS: Such a sweet and heartwarming story about an older couple falling in love during the magic of Christmas. With the help of some grandkids. THE MISTLETOE BACHELOR AUCTION: Rose wants to just be herself. She is a famous model and so many men have tried to take advantage of her so they could get a little bit of that fame. When her sister buys her a date at an auction, neither she nor Ryan are prepared for what happens. I'm always ready to read a Christmas book and especially when the temperatures are hot in the summer! I've been able to read 4 of these books so far and they are wonderful. Each different so it keeps your interest! 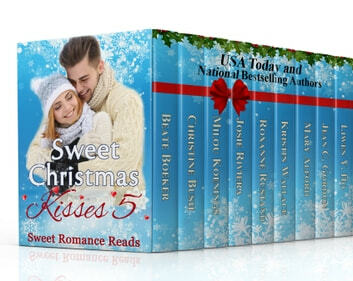 That's why I like The Sweet Christmas Kisses boxed set each year! The books aren't too long but long enough to be a good story with great characters! The four I got to read are: GHOSTS FROM CHRISTMAS PAST by Mary Alford: This isn't any kind of ghost story, so don't worry about that! Charlotte has been in a coma for EIGHT years! I can't even imagine that! She was in a car accident in which her parents died. More amazing than that, her sweetheart, Dylan, has waited all this time for her to wake up even though just about everyone told him it would never happen. Charlotte is still in a "brain fog" so she doesn't remember a lot of things so Dylan just hopes that she will remember him again. Such a sweet holiday story filled with hope, love and a promise of the future! Loved it! CHRISTMAS PIZZA TO THE RESCUE! by Jean C. Gordon The title alone makes you want to read it and find out how pizza and Christmas are connected! the opening scene is sad but it is the basis for why Royce Evans, a champion motocross racer, becomes a loner and is in his headquarters at Christmas rather than with other people! Samantha Linder, a journalist, delivers pizza to him and hopes to get a story from him but they get stranded during a storm. A crisis of trust happens later and you'll just have to see how it all works out! Another fun story and fun characters! SECOND CHANCE CHRISTMAS by Kristin Wallace I love stories that involved a huge miscommunication in the past and it changed the whole lives of the people involved! That's what this story was about! Poor girl, Mia, and Rich guy, Win, secretly dated 10 yrs. previously but had to hide it because they lived in a small town and that just "wasn't done"!!! She becomes pregnant and tries to tell him only to discover his former girlfriend telling her that she and Win are engaged! So, Mia flees the state, never telling Win for 10 yrs. until she has to return because she's sick and broke. Well, you can guess how this one goes but it's VERY sweet and I absolutely fell in love with Win!!!! I loved the daughter, Riley, too! Another winner! THE LOVE CLAUSE by Liwen Y. Ho I really enjoyed this one because I love it when the male lead character is a total jerk at first!!! He was certainly that! All he wants to do is work, work, work at this law firm and he expects everyone else to do the same. His boss suddenly changes overnight and wants people to have an "outside the office life"! He doesn't agree but has to bring a fake date to the office party. He just randomly picks a girl at the office that helps him with his paperwork! She needs a fake date to a wedding so they agree to help each other but NO feelings or relationships - easy peasy!!!! Well, maybe not..... I enjoyed learning a little about the Chinese culture and the ending was hilarious! I laughed out loud! Exactly, the best things in life happen if you dare to embrace it! I've only read the first story so far, Christmas with the Poker Group. This is a short and yet big love story between Sabrina and Mick with lots of humor and surprising moments that will make your heart beat faster. Even though I read the story in the middle of a heat wave, I dived deep into the Christmassy atmosphere in Italy and the thoughts and feelings of the hero and the heroine. And readers who know the cozy mysteries of Beate Boeker will have the pleasure and fun to meet their old friends, the Mantoni family, again. It's never too early nor too late to get into Christmas romances! This collection of 9 stories absolutely melted my heart and got this grinch into the holiday spirit (even though it's not Halloween yet). Each of the stories in this collection were sweet, and I even found some new authors to follow! I definitely recommend this collection of you love sweet, holiday romances.